Well, making a dish en papillote is a fun way to serve it. After all, you serve the dish like a gift. 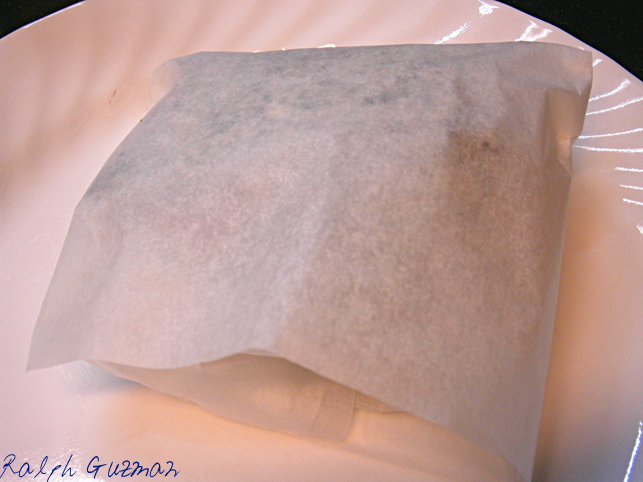 To cook en papillote is wrapping food in parchment paper and then baking it. After baking is done, you serve it still folded and unopened, leaving yourself and your guests to slowly unravel the surprise dish inside. Just like a gift, right? You can cook almost anything en papillote. You can make fish, pork, and even pasta en papillote. 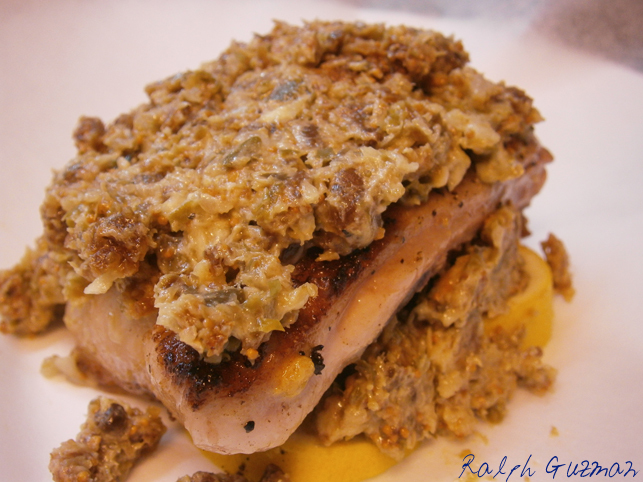 What I love about this style of cooking is how it keeps the food — in the case of meat or fish — very moist and juicy. You lessen the probability of burning the food too. Last night, after a four-hour drive back home, I made Chicken with Fig Relish en Papillote. It was a much-deserved gift to myself after a very long day and a very long week. Here’s the recipe. The first thing I did was to marinate the chicken in olive oil and lemon juice. Leave it for a few minutes. To maximize the flavor, 30 minutes would be good. You can, however do it for as long as two hours. I did the marinade for 15 minutes and it still turned out great. While marinating the chicken, I prepared the relish. 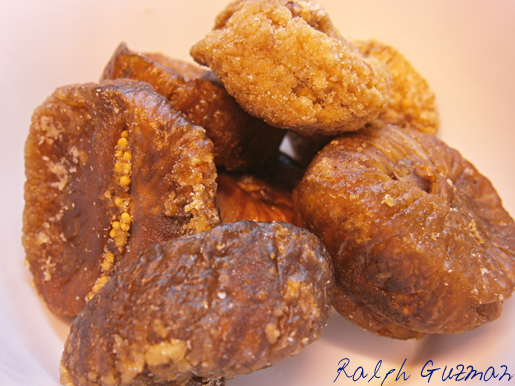 I used dried figs, which are sweet. They have a long shelf life, which is why I enjoy cooking with them. They are very easy to find. 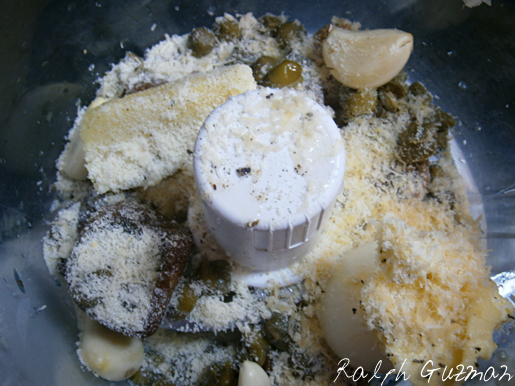 In a food processor, add the figs together with the capers, garlic, onion, the cheeses, butter, olive oil, and lemon juice. Process the ingredients until they have the consistency of a relish. Then set aside momentarily. You can prepare this relish beforehand. I love how the sweetness of the fig contrast with the salty flavor of the capers. They blend well with the other ingredients. The next thing I did was to saute the chicken in medium-high heat with butter and olive oil, as I wanted the skin to be crispy. You don’t achieve crispy skin if the chicken is just baked. Just saute it for about 2 minutes per side, which is enough time to just get to a golden brown color– without completely cooking the chicken. So, the objective of sauteeing is just to get a crispy skin and brown the chicken, which gives it a better appearance. At this point, you would be ready to assemble the dish for baking. You will need a 9×9 inch cutouts of parchment paper. Each cutout will have one chicken. 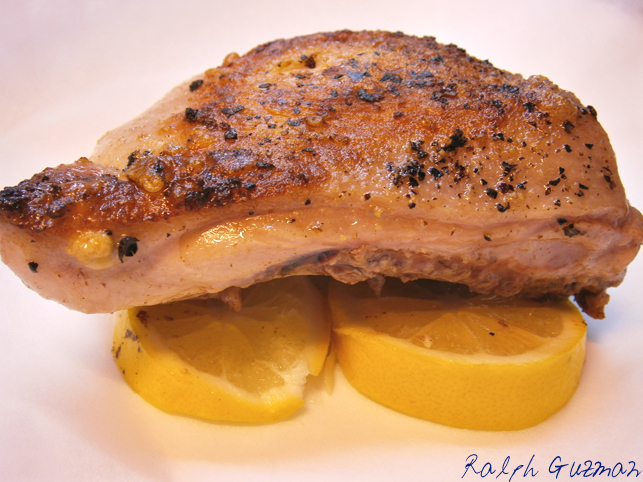 I put two thin slices of lemon in each parchment paper cutout to keep the chicken moist and to add flavor to the dish. It adds extra aroma too. 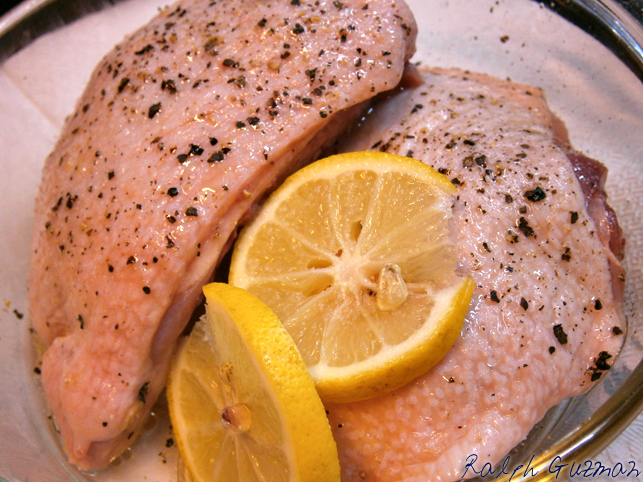 Place the chicken on top of the lemon slices. Spread the relish on top of the chicken. Wrap the chicken as you would a sandwich. 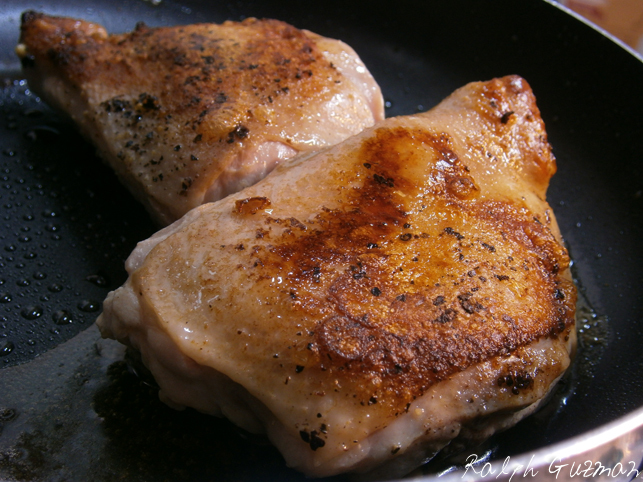 Bake for 15 minutes at 175° C or 350° F. You can put all the chicken pieces in the oven all at the same time. You can put all the chicken on one tray to easily take them out. After 15 minutes, here’s the finished product. I loved how juicy the chicken came out. The relish cooked very well too and tasted so delicious. It smelled very fragrant too, because of the lemon. Delicious! You can eat it as it is, or even have it with rice or mashed potatoes. This dish serves 2 to 4 people. It’s delicious, and it’s a fun, wonderful way to surprise your loved ones! Do try it today! 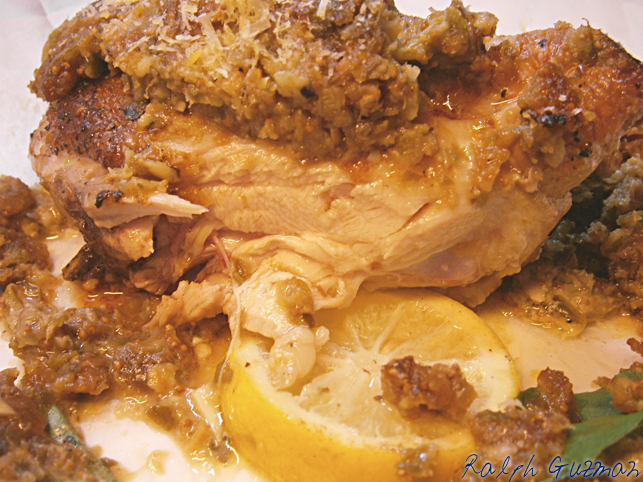 This entry was posted in Food + Recipes, Meat and tagged Caper Relish, Chicken, Chicken En Papillote, Chicken Recipe, Chicken Recipes, Chicken with Fig Relish En Papillote, En Papillote, En Papillote Recipe, Fig and Caper Relish, Fig Relish, French Cuisine, ralph guzman, Ralph Guzman Foodie, RatedRalph.com, Recipe for En Papillote, Recipe for Papillote by Ralph. Bookmark the permalink.